Officials from the Town of Hearst say they have located the source of a major leak in the town’s water system that started just over a week ago. It caused a state of emergency to be declared Wednesday morning, which will allow the town to access provincial money if needed. According to officials, the town remains in emergency state for the time being, as does the boil water advisory. Water pressure will vary for those whose water has been restored. The town is asking citizens to limit consumption of water while the problem subsists. An update from the town is expected by the end of the day. 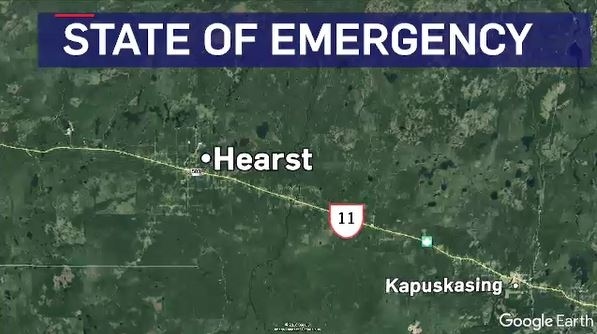 A state of emergency has been declared in Hearst after a major break of water services occurred in the town. According to town officials, the break has been isolated to an area that stretches from Ninth Street to Third Street and from Highway 11 to the Mattawishkwia River. While water has been restored to other parts of town, it remains off in this area as crews from the Public Works department and the Ontario Clean Water Agency attempt to locate the exact source of the leak. Deputy Mayor Conrad Morin is acting as mayor while Roger Sigouin is in Toronto on official town business. Morin told CTV News that the leak was first noticed by OCWA employees on Tuesday and became progressively worse over the last 24 hours until a state of emergency was declared. Morin said that officials from Town Hall, as well as fire and emergency crews in Hearst will meet to determine how the town will proceed. Université de Hearst, Collège Boréal’s Hearst campus, and all schools in town remain closed Wednesday, February 6. The town’s arena and pool are also closed, despite being located outside the area where the water remains shut off, however Morin said the town plans to reopen both the facility by 1 pm on Thursday. A boil water advisory has been issued by town officials until further notice and residents are recommended to remain in their homes.